Rather than following an isolated route on its way on its journey from the last years of the Ottoman Empire to the present day, Turkish music stands out in the way it has remained open to outside influence and innovation. Though up until the 19th century it was unable to take in the polyphonic music that spread from Europe to the entire world, the Ottoman Empire and the Turkish Republic that succeeded it did accept this trend, and put it into practice at home, in nearly every branch of music. Thus, if we consider the arrival of polyphonic music in the Ottoman Empire as the sowing of the first seeds of contemporary Turkish music, it is appropriate to begin this account from the first years of the 19th century, when the Ottoman Empire itself was taking its first steps towards westernization. Polyphony, along with the pioneering steps of westernization, could only come during the most illustrious era of the Turks: in the early 19th century when the Ottoman Empire was extending its borders beyond Anatolia and into Europe. During those years, when the European tradition had taken on polyphony centuries earlier and was now embarking on its own new searches, the Ottoman empire, as though wishing to make up for this delay, made polyphony a sine qua non of the music in the palace. Up until that time, though not regularly performed in Istanbul, opera, which was born in Europe during the 16th century, was enthusiastically received by the Ottoman Palace. In the 17th century, during the reign of Sultan Mehmet IV (1641-1676), opera companies from Venice are known to have performed in Istanbul, and met with great interest on the part of the high officials at the Ottoman Palace. In the 18th century, during his trip to Paris in 1719, Çelebi Mehmet Efendi was received by the King of France, Louis 15th, who had just turned fifteen. His reception included a performance of opera. Giving a lengthy description of this reception in his Seyahatname, Çelebi transmitted the details of this art - and thus, of polyphony - to the Ottoman capitol. Actually, the establishment of polyphony as a sine qua non in the Ottoman Empire begins with its institutionalization in 1826. During this year, the country's first polyphonic musical institution, the Mizika-i Hümâyûn (Music of the Ottoman Palace) was founded, and with the support of the state, the development of polyphonic music began in Turkey, to continue to the present day. The Mizika-i Hümâyûn was founded on the example of western military music. Its foremost goal was to play Turkish melodies on western instruments. In this way, Turkish musicians became acquainted with western notation for the first time. This was taught by western musicians who visited the Empire during the reigns of Sultan Mahmud II (1808-1839) and his sons and successors Abdülmecid I (1839-1861) and Sultan Abdülaziz (1861-1876). The Mizika-i Hümâyûn, later known as the Riyaset-i Cumhur Incesaz Heyeti, continued until the year 1924. Though they had difficulty in adapting within such a short period, Turkish musicians speeded their progress with the aid of European musicians. In 1828, the Italian musician Giuseppe Donizetti came to Istanbul, and as a skilled conductor and educator, transformed the Mizika-i Hümâyûn into a "Palace Orchestra" within a short period. In 19th century Istanbul, the establishment of a string orchestra in the Ottoman palace in 1840 and the visit to the Ottoman capitol by the famous Hunarian composer Franz Liszt, can be counted among other developments towards achieving European standards in the area of music. Liszt composed two preludes for Sultan Abdülmecid. After him, composer and violinist Henri Wieuxtemps was the guest of the Ottoman Palace for a recital. At the death of Donizetti Pasha in 1856, Callisto Guatelli, who was then conducting the orchestra of the Naum Theatre, was brought to conduct the Mizika-i Hümâyûn. Having hosted European musicians in their palaces in the desire to follow Europe's direction in music, the Turks during that period began sending their talented artists to Europe. In the 19th century, the first Turkish composers to use polyphonic techniques went to study at European conservatories. Some of these include Dikran Çuhaciyan, who in 1860 studied piano and harmony examined examples of opera buffa in Milan; Macar Tevfik Bey, who completed his education in Venice and in 1876 was brought to the Palace as a piano instructor; and Edgar Manas, who traveled to Italy to study piano with Trevellini and harmony and counterpoint with Butazzo. In 1908, entering the Mesrutiyet (constitution) period, the Ottoman Empire truly began showing the influence of the internationalist trend. 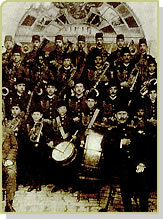 Foreign musicians serving the Mizika-i Hümâyûn returned home, to be replaced by Turkish musicians. Saffet Atabinen, student of Guatelli Pasa, and later on Théodore Debois in Paris, became the Mizika-i Hümâyûn's first Turkish conductor.